Spaghetti Squash Casserole is not something that I remember eating in my youth. In fact, I didn’t know what a spaghetti squash was until I was just entering my college days. Man had I been missing out. While I did grow up in an Italian-American family, lasagna was a dish that I always looked forward to. We didn’t have it very often, but when we did… we did. I remember my mother always making 4 or 5 pans of the Italian dinner and sharing some with family, freezing some, eating some (or a lot…). 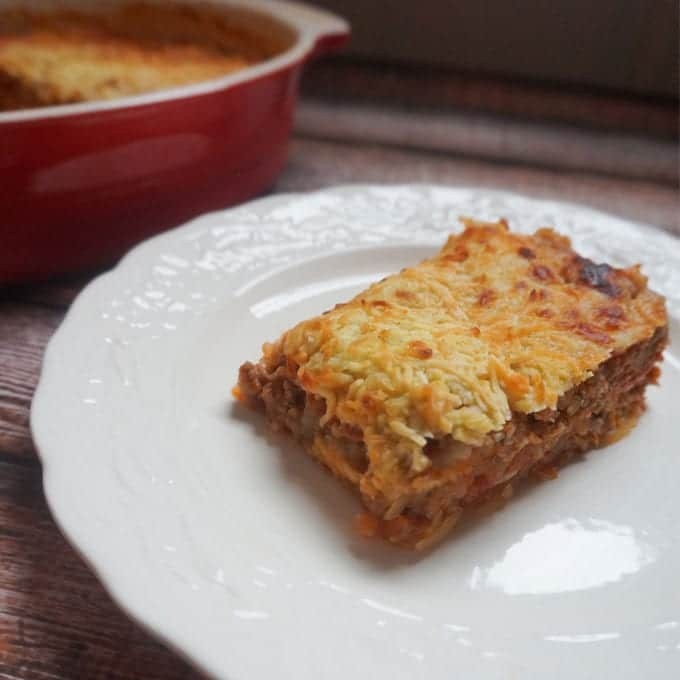 Naturally, when I started eating according to a Keto diet, I knew I had to make a low carb and high fat version of this lasagna! Layers of fatty meats, creamy cheeses and slightly crisp spaghetti squash create a dish that will be a hit for the whole family. This is my Italian Spaghetti Squash Casserole. This recipe is a great base for others as well. Instead of ground beef, try using turkey and Mexican seasonings for a different flavor profile. In a large skillet, start browning ground beef and Italian sausage on medium-high heat, breaking meat into smaller pieces with wooden spoon. Drain excess fat. Add in salt, pepper, garlic powder, red pepper flakes and stir until meat is cooked through. Add in tomato paste and vegetable stock and mix until evenly incorporated. Add in tomato puree, sweetener, dried oregano and basil. Let cook and stir occasionally for about 10 minutes. Add in spaghetti squash and stir until incorporated. In a medium sized casserole dish, spread out half of the mixture on the bottom of the pan. On top, layer the mozzarella, parmesan and half of the pepperoni. Add remaining squash and meat mixture on top. Top with remaining pepperoni and reserved mozzarella. Cover with foil and place into oven for 45 minutes. Take out of oven and remove foil. Change oven temperature to broil. Place back into oven until cheese is bubbly and golden brown. Usually 2-5 minutes. Remove from oven and let rest for at least 10 minutes. Another beautiful thing about this recipe is that it reheats and stores well. It’s also a great dish to prepare ahead, keep in the refrigerator and bake off when you’re ready to eat! What are you waiting for? Give my Italian Spaghetti Squash Casserole a try! What’s your favorite make ahead meal that gets you through the week? Share below!